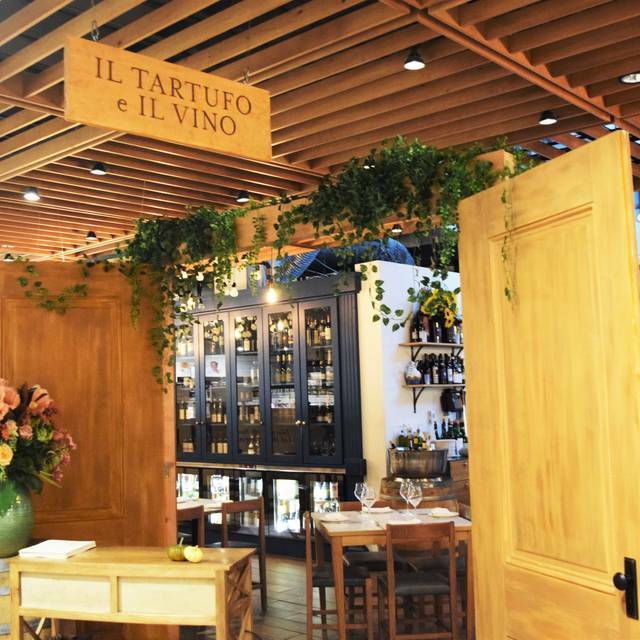 Monday - Thursday: 11:30 a.m. - 2:30 p.m. & 5:00 p.m. - 10:00 p.m. Friday - Sunday: 11:30 a.m. - 10 p.m.
Eataly Boston's new pop-up restaurant, Il Tartufo e Il Vino, celebrates the magic of fresh Italian truffles (brought straight from Italy by Urbani Truffles) and wine through indulgent dishes and unique experiences revolving around this revered culinary gold. 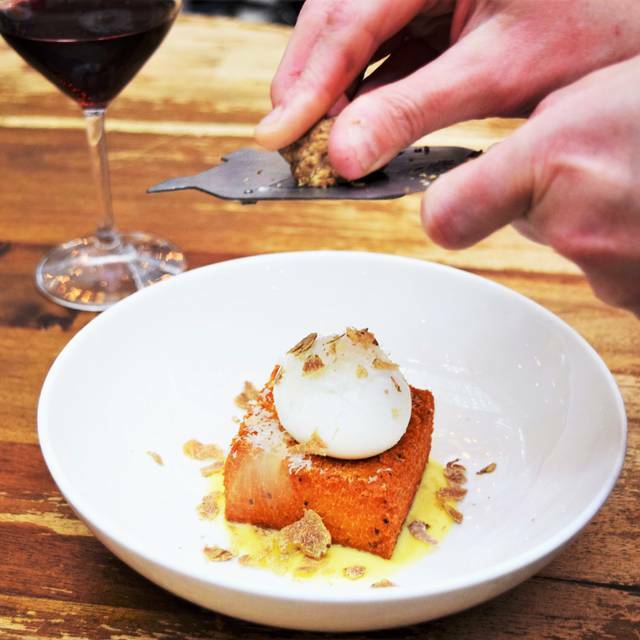 Don't forget to enjoy perfect wine pairings with each of your truffle-forward dishes designed by Chef Sam De Los Santos. Food and service were outstanding. Can't give a top rating for ambiance and noise as this isn't a stand-alone restaurant, but I would still highly recommend! I thought the restaurant catered to unsuspecting tourist. I thought the menu was far too limited and the portions teeny for the prices charged - we could have whipped up the food at home and better tasty - which we ultimately should have done. Food was good, but the ambiance was terrible. There were not many tables in this restaurant, and most of them were located close to aisles in the shopping area. They would do much better if they could put up some sort of walls or dividers to keep out some of the noise of the shoppers in the grocery store. 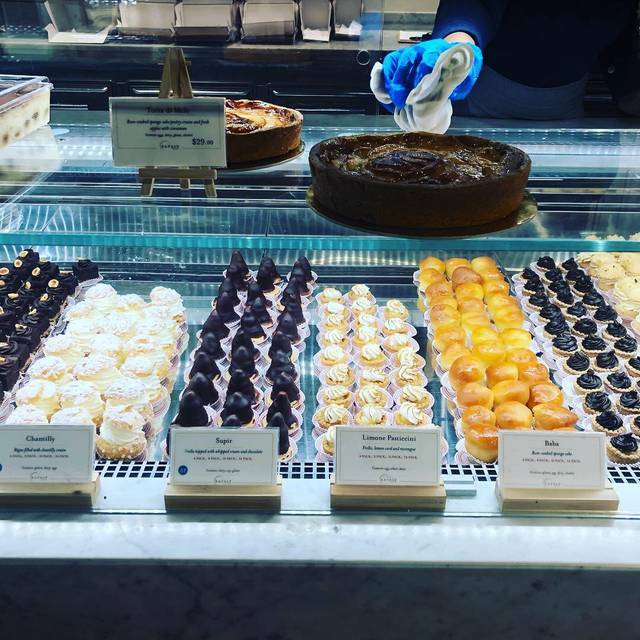 We ate at an Eataly in Rome Italy, and had a much better experience. We’ve been looking for great pasta all over town and this place has it! Go before it closes. Limited menu, small portions for large price. Pasta was good but bland. Could barely taste the truffle! I loved the Italian market concept that surrounded the restaurant. We were seated promptly and the service was excellent. The menu was quite limited though. Portions we're small as well. My daughter got the Agnolotti which was excellent. My pasta dish which was billed to be a truffled pasta was really disappointing. I had a hard time detecting any truffle flavor, basically it was very plain pasta with a tiny bit of parmesan cheese and ?truffle on top. 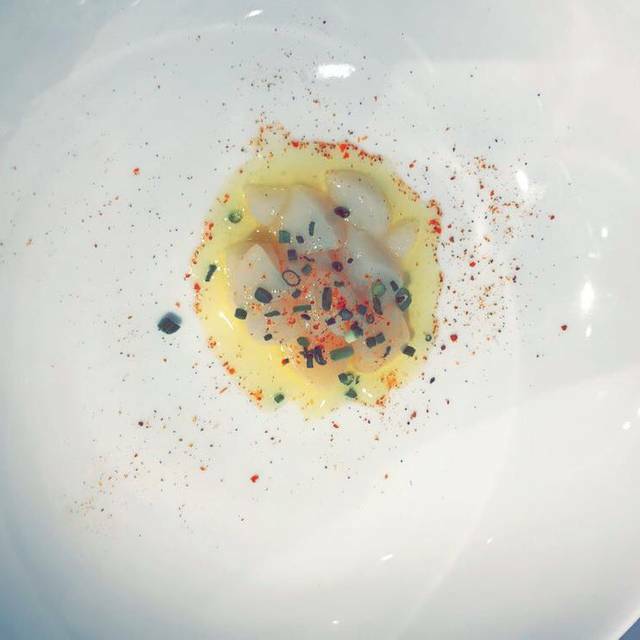 I am surprised that a chef would serve such a plain meal. It had basically no sauce/flavor. The noodles were homemade, but that was the only positive. This dish needs to be better!!! Service was excellent and everyone was very friendly. Unfortunately I, based on the food/value , I would not return. I was excited to order truffle and Parmesean pasta but was super disappointed by what I got. For 20 dollars it was a tiny amount of spaghetti that tasted like simple butter noodles with hardly any truffle flavor at all. However, the customer service was phenomenal and the wine was excellent. Very vibrant spot with many good choices. All staff including those in the overall facility (Eataly) were friendly, courteous and knowledgeable. An exciting spot to spend time in a relaxed shopping space with high quality products without having to venture too far. Good food, nice ambiance, excellent service! I would come back at any time! We had a wonderful experience. The environment was welcoming and the freedom to explore Eataly was a great surprise. The food was delicious and our waiter was a delight. 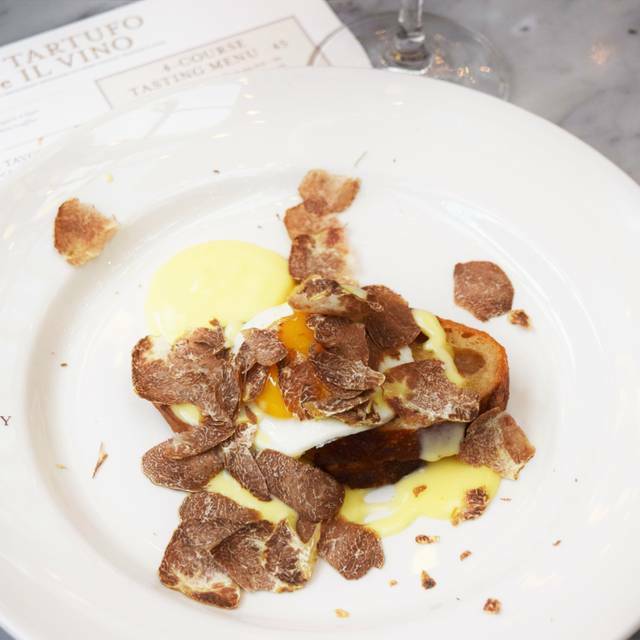 We were so impressed with the food at Il Tartufo. I had the chicken mousse and skatewing, my husband had the beef tartar and the agnolotti. The place was busy and the tables are small so its a bit tight in there, but the food is so good! Bad experience for the spring restaurant week. Tiny flavorless meals. Will not return. The maitre’d was not very polite, responsive or helpful. Since this is the first person you meet, it set a tone of bring unwelcome. Luckily, we had a very nice waiter. We had to wait 30 mins despite having a reservation. 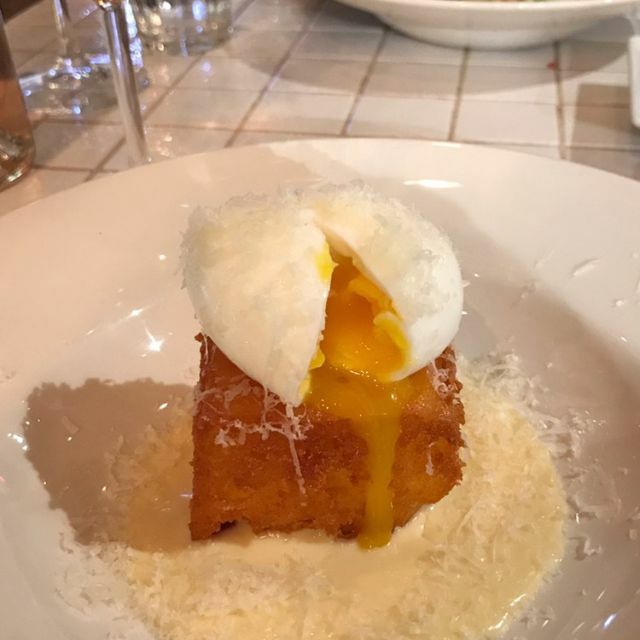 I was so impressed with the food at Il Tartufo, especially given that we ordered off of the $18 Spring menu! I'm so used to places providing extremely small portions when doing these 'restaurant week' offerings, but not the case here. I had the chicken mousse and skatewing, my friend the beef tartar and the agnolotti. We also ordered a formaggio app off the full menu, because we thought we might need something extra. The rice flavors and the full portions left us both satisfied. The delicate sauce served with the skatewing and the creamier sauce of the agnolotti were both incredible. The place was busy and the tables are small so its a bit tight in there. Our server was also handling many tables, so service was very minimal, but functional. The one item that stuck for me was the wine service. They were advertising $25 spring wines, but our server couldn't give us any recommendations as he hadn't tried any of the new wines. He did however recommend a $50 bottle of wine instead. I get that you want the up sale, but I would hope that management would have their servers sample new wines or at least provide basic tasting notes, if your going to offer discounted bottles. We ended up with a nice crisp Bianco off the Spring menu (I googled the tasting notes before we ordered) and were very happy with it. It paired very nicely with the rich flavors of the mousse and delicate fish. I would definitely go back! Service was non existent. I asked for water at least 3 times and the server neglected to bring it. When I asked for the bottle, she brought it but did not fill my glass. No one came by to ask if our entrees were satisfactory. Very good on every front. Very good and fresh homemade pasta situated in the middle of Eataly, the service was great also wasn’t an issue for us but it is a little hectic and loud if you’re there for an earlier dinner. Very noise place, you cannot listen to your friends. we had no idea its "open" concept. service was great but food potion was so small! I expected large size riviolli for $18 and got 4-5 pieces. Restaurant was in the center of a busy shopping environment, so it was quite loud. Service was a bit slow but I can forgive that on a Saturday night. Had the best ravioli of my life (butternut squash). Portion was small but decadent. Prices were high, would go again if the prices were lower. Sub par at best. Our server Adam was amazing! He was the best part of our experience. The food was bland, no flavor at all! The gnocchi tasted like flour, someone definitely over floured the sauce. I was then told that in order for the gnocchi to be good I need to purchase the (over priced) truffle. A dish on a menu should always be eatable with or without any add on. I was not going to pay over $50 for a gnocchi dish, unacceptable. I truly had high hopes for this restaurant. They did send us a different pasta which was ok. I expected more from this place. I can see where they wanted to go with the concept, it was just poor execution. Food is delicious, service is great. Space is tight for parties pf 5+. Great overall. The truffles did not smell like anything. They did not shave the truffles in front of us. It was a waste of money since the scent and flavor were not present. The ambiance is hectic and chaotic and servers barely pay attention to you. If you want to get the tasting menus everyone in your table has to as well, which doesn’t work if one of you is vegetarian. A disappointment at best - I have eaten at a few of the other Eataly's in Europe - and had high hopes - I was totally disappointed - the food portions are minuscule -the menu similarly small - - and the food was at best fair. I was surprised how small this restaurant was but it was adorable. The server was very knowledgeable and the food was excellent, I was just kind of sad they didn't have the white truffles available so I didn't really get the truffle experience. Other than that my boyfriend and I had a great time. My overall take away is, I won’t be back and I won’t recommend. The dishes were tasty enough, but sheesh they were small. $26 for what would be a half portion of linguine with clams( I got 5 or 6 tiny clams) at most restaurants, was a bit much even by Boston standards. The food was amazing and the wine was good, but the price was steep. The biggest issue is that the restaurant is right in the middle of a busy shopping area, and it is not actually walled off. You and the shoppers can see each other the whole time. The table placement within the restaurant was also crowded. Ultimately an enjoyable experience, but for the price paid I would expect a nicer, more romantic ambiance. We went for Valentine's Day. 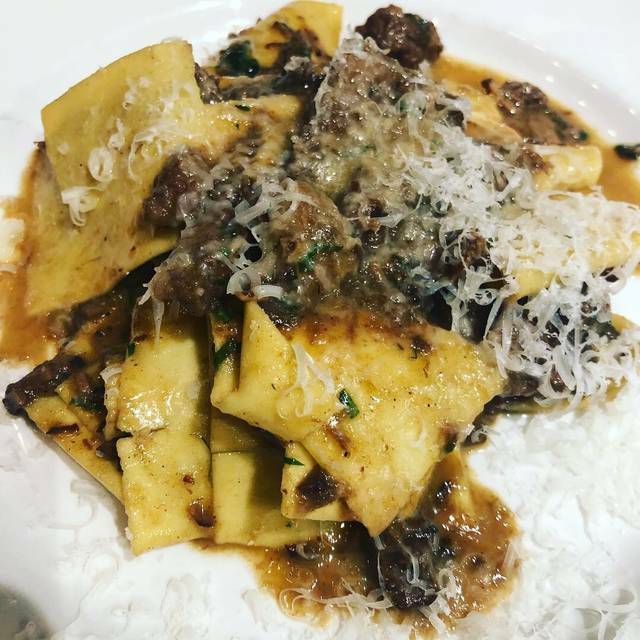 All-in-all, very good, but because it was late in the season, they only had one type of truffle to offer, and their Barolo bar was closed, and without these “bonuses,” it would probably not be my first choice of Italian restaurants in Boston. Nice Italian wine selection, friendly, helpful service, definitely a good spot to eat if you’re in the area. It is definitely getting to the end of truffle season, as they only had black truffle available. I would expect them to close this pop up restaurant soon, but the squash ravioli was delicious. 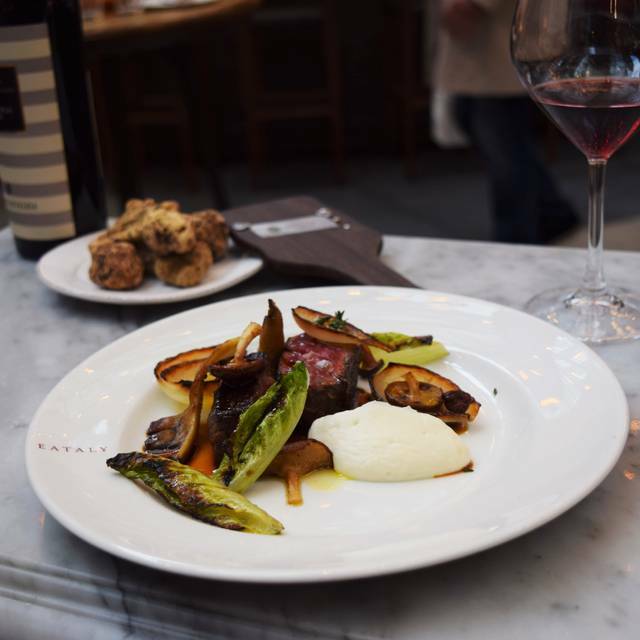 We usually enjoy dining at Eataly and working our way through all of their venues. This spot was formerly a seafood oriented restaurant, but is rebranded for the winter as a truffle and wine venue. Fear not, most of the dishes can be ordered without truffles, they are an add on, usually at an additional cost. Service was friendly, fast and efficient, as it usually is at Eataly. The restaurant was empty for lunch, perhaps because it was Super Bowl Sunday. Arancini were a huge hit at the table, as were he butternut squash ravioli. The gnocchi in a chestnut cream however would not be something I would order again, we found the flavor to be bland to our taste. My husband and I enjoyed our truffle-enhanced dishes, but were disappointed that the prix fixe tasting menu was gone by 5:30 (!) and the a la carte offerings we're not conducive to composing a balanced meal. We settled for one dish and a glass of wine each, having come with the intention of several courses and a bottle. A busy, bustling, food Mecca!! Reservations a necessity as it’s a thriving cheese-wine-food overload metropolis!! Fabulous entrees, amazing staff, great vino.... no complaints. Even if it was horrible, I would still give it five stars as we are VERY fortunate to be able to eat wherever we want as a society. Some are not so fortunate. Do take what we have at our fingertips for granted! Portions a little small. Food quality was good. Waiter could has asked if we wanted additional cheese or salt and pepper. Although a truffle restaurant you have to pay 25$ p.P. on top to get 5g of truffle. Staff not very helpful on request to share the 5g on 2plates. Food was mediocre, nothing outstanding. I was afraid that it would be overly loud or busy, but it was a perfect dinner! 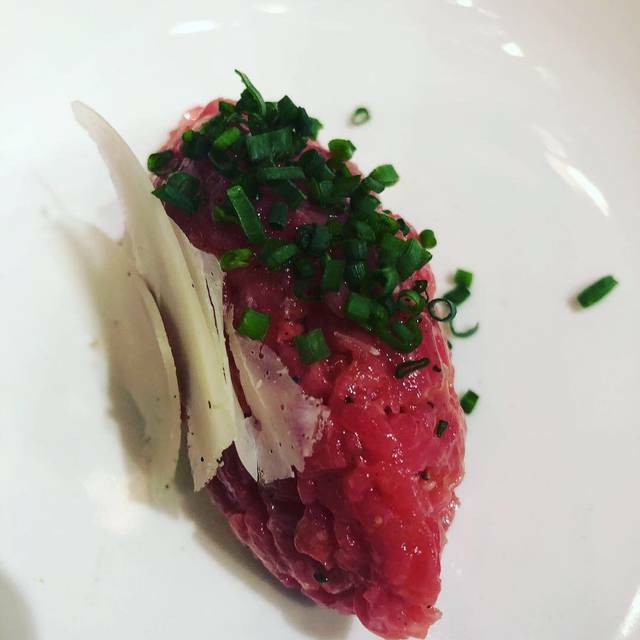 I was expecting a quaint quiet restaurant, and was unprepared for a restaurant in what is kind of an amazing Italian store - with everything from cheese to prociutto to olive oil - to, well you name it. It was noisy. We have the 4 course tasting menu with pared wines. The food was good, but the waiters spent no time describing the courses or the wines nor how they decided on how to pair it. They did not change the glasses so each wine sat atop the previous wine in the sam glass. At basically $100 a person, it was not worth the value.